These ambitious projects are littered with every possible acronyms and include proposed road links, air connectivity plans, electricity grids and special economic zones on coasts, says Subhomoy Bhattacharjee. There are bridges on a 500-km road link from Moreh in India to Mandalay in Myanmar which cannot hold the weight of even a pickup truck. These structures are among the bridges that need to be rebuilt for inter-country coordination around the ambitious India-Myanmar-Thailand (IMT) connectivity project, in the works since 2015. It is one of the clutch of 50-odd projects India and the Association of Southeast Asian Nations (Asean) have lined up to deepen connectivity, in the past two decades. But these, like the weak bridges, have been held up for every possible reason, mostly political. Delhi is now keen to revive these and is scrambling to reach out to several of the 10-member nation groups, in response to the ambitious China-sponsored One Belt, One Road (OBOR) economic programme. “There is a need for government support to make many of these projects work,” says Deputy National Security Advisor, Arvind Gupta. The projects are littered with every possible acronyms and include proposed road links, air connectivity plans, electricity grids and special economic zones (SEZ) on coasts. Few have come to life, cutting through the deep suspicion among the member- states to cede controls. But, Johny Chotrani, chairman of the Philippine-India Business Council, says the Asean wants India to step ahead to deepen economic connect with the region. Stepping ahead means India has to support the viability of many of these projects. The IMT project, for instance, is supposed to offer seamless movement of cargo and passenger vehicles between Moreh in Manipur and Mae Sot in Thailand. Pritam Banerjee, senior director-South Asia at Deutsche Post DHL Group, says weak bridges are examples of simple obstacles holding up the project. His company is working on the logistics network. There is more weighty stuff, too. Myanmar, faced with a regime change, wanted to play safe. It insisted that papers of international vehicles have to be sent for customs clearance to capital Nawpyidaw, 800 km away. Thailand, to placate its tough truck lobby, did not want any shipment by foreign trucks on its soil. “Differences between the three countries on the procedures to measure something as simple as this have not been sorted out,” Banerjee says. India is looking at options to get the neighbours on to the negotiating table. Prabir De, professor at Delhi-based think tank RIS, points to other examples, like the proposed SEZ at Sittwe, Myanmar. 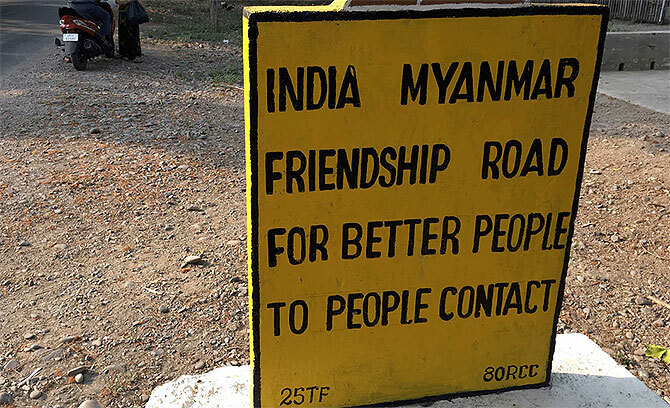 In 2013, India had offered credit of $150 million to establish the project in Rakhine state. The Myanmar government offered 1,000 acres. “But there has been no movement beyond that,” he says, though India has completed a port to go along with it. The Indian SEZ and port is upstream, with a shallow draft, while a competing Chinese SEZ downstream can berth bigger vessels. Delhi has now started to show an urgency to push ahead with the projects. This week it has given six cargo vessels to Myanmar to support one of those projects, the Kaladan Multimodal Transport Project, that will make Sittwe SEZ more viable. In fact the most ambitious set of projects in this context are the plans to link SEZs and industrial zones in Thailand, Singapore, and Cambodia with their counterparts on India’s eastern seaboard states. As De notes, to create a buzz, some things can be made operational quickly, like building a network of transport operators and offering a Schengen-like visa system for business travellers. External Affairs Minister Sushma Swaraj said as much at the just-concluded Delhi Dialogue. “We are making efforts on all fronts to enhance physical and digital connectivity.” She said the India-Asean cooperation builds on commerce, connectivity and culture. He suggested this could mean getting involved in projects that might not have an immediate pay-off for India but will promote goodwill. Chairman, RIS, Hardeep Puri agreed that the Indian response should not be seen as competition to the Chinese outreach. The urgency to get the projects up and running has begun to percolate in the various Bhawans of Delhi. Last year, India had promised Rs 370 crore to strengthen 69 of those bridges on the IMT corridor. Tenders for construction of 120.74 km between Kalewa and Yargi are completed. The civil aviation ministry has been nudged to fast-track negotiations to offer ‘fifth freedom rights’ to the Asean. Along with the ticklish aspect of standardising customs, are those like vehicle driving standards and differing payment systems between Asean and India. It is here, more than anywhere else, where government support is needed, says Rajat Nag, former managing director general of the Aaian Development Bank. Just to drive a truck from India to Thailand or Laos needs clearance from four motor vehicle standards. Many of these are meant to stifle competition than expand commerce. China, faced with the same challenges, has railroaded many of the countries to adopt its home standards. For India, that is simply unviable. The bureaucracy, unused at looking at these problems even at a national level, is finding it difficult to learn the tricks. This is where the role of companies like Banerjee’s becomes invaluable. The OBOR push shows there is an urgency now to ensure the standards, too, get harmonised.